For my son's party you may recall that he had both boys and girls over. Thus we had both Pirates and Pixies arriving to take part in the mayhem. Of course, we had some girl pirates, but with girls you never know. So for girls coming I knew I needed to make Izzy's Pixie Dust Pouch. I heard after from a few Mom's how disappointed their girls were by the fact that their Pixie Dust didn't actually work. Just be careful to let them know this is pretend! 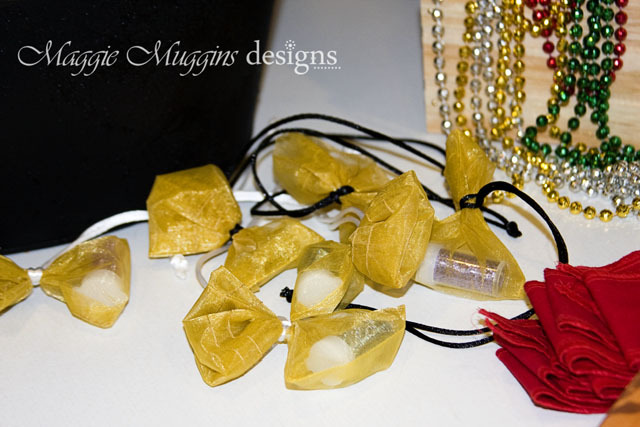 I used a large gold organza bag that I had and cut it up into smaller sizes, then sewed them into small bags. You could skip that step by just buying them pre-made in the small size. Most craft stores have these bags or you can get them here. We popped in little tubes of glitter from the dollar store. My son managed to pop his tube open inside the bag and guess what? The glitter doesn't come out, it's too big. So you can test the glitter you get and try just dumping glitter in instead. I tied these shut using necklace ribbon but you can use pretty much anything. I lopped it around and through, which would have been long enough, but once I lopped it around wasn't long enough to fit over heads anymore. Oops. To fix that I tied my sons with some jewelry wire and looped a jumpring through it and around the ribbon. Now he can wear his Pixie Dust just like Izzy does!